Ghost words are words that have typically never existed in reality, but that get taken into account in reference works or scholarly research and come to have a life of their own until they are noticed and removed. Erroneous citation, spelling or printing mistakes, or misreadings can all be reasons that bring ghost words into existence. Ghost words have plagued linguistic research at various points—imagine publishing an analysis of a strange Latin word, only for a later scholar to point out that the word was originally misspelled in the text edition you were using. Something similar can happen when some source claims that a language is or was spoken in such-and-such place, and later sources adopt that claim as fact, but in reality there never was (or never plausibly was) such a language in such a place! For example, I recently came across a Wikipedia page for the Zurg language, a Berber language apparently spoken in Kufra, Libya. (Note: this is probably not an inside joke referring to the Zerg). Clicking around the Wikipedia pages for Berber languages, one notices as well that a Tmessa language is classified as part of Eastern Berber, but clicking on it redirects one to the page for the language of Sokna, Libya (a real, though probably recently extinct, language). Strangely enough, most Berberologists have never heard of either Zurg or Tmessa. It should be noted that the geography is a bit off, and Augila (Awjila) and Djalo (Jālu) are two separate oases in eastern Libya, only the former of which is Berber-speaking. “El Fodjaha”, also misspelled below, refers to El-Fogaha الفقها. Note  of the Wikipedia article refers to an article in Russian which also names Zurg and Tmessa as Berber languages. Note  is the above-cited work by Blažek. As far as I know, there is no Berber language spoken in Jaghbub (an oasis near the Libyan-Egyptian border), except by Siwans who sometimes went there for work (and spoke Siwi, if they used Berber at all when there). Again, I’ve never heard of either Zurg or Tmessa varieties of Berber. Of course, in the above sources none of the scholars can give any data for either language, because there isn’t any. “…haben in den vorher aufgeführten Berber-Kolonien Sôqna, Waddân, Temissa Berberdialecte, die dem von Ghadàmes nahe stehen, noch Bürgerrecht neben der arabischen Sprache: doch sind dies streng abgeschlossene Sprachinseln. So if “Tmessa” could be pulled from Nachtigal’s impressionistic report as a real Berber language, why not “Waddan”, which otherwise is never reported as having (or having had) a Berber language? Perhaps Nachtigal had good information that Berber was spoken in “Temissa”. But as probably both documented Berber languages of central Libya (in Sokna and el-Fogaha) have probably become extinct this past century, is it even likely that a Berber language of Tmessa would have survived until now? Doubtful. Zurg is a locale within the oasis complex of Kufra, itself home to Tebu speakers (and perhaps various languages from Chad spoken by migrants) but not Touareg as far as I know. Interestingly, of all the Wikipedia entries for Kufra, only the English version mentions this locale (“ez-Zurgh”), along with a note pointing to the 1929 edition of the Guida d’Italia del Touring Club: Colonie e Possedimenti—however, no reference to the Zurg language is there. The Guida states that Zurg was inhabited by only a few hundred slaves—if accurate, this also makes it unlikely that a unique Berber language was spoken only in that specific locale within Kufra. Otherwise, I haven’t been able to track down other passages (e.g. in travelers’ accounts such as Rohlfs or Forbes) which may mention a connection between Zurg and Berber. Attualmente nella parte orientale e centrale del Fezzán l’arabo domina quasi assolutamente. Parecchi anni fa un berbero di Augila che, come altri suoi confratelli, aveva molto viaggiato e conosceva vari paesi della Cirenaica e della Tripolitania, parlandomi di località ove il linguaggio berbero si era conservato, mi nominò, per il Fezzán, el-Fogaha, Trághen, Tméssa, et-Tuíla, Sébha, ez-Zíghen. Sarà necessario per accertare se almeno parte di tali osservazioni risponda a verità, fare una minuta indagine sui luoghi. Nel breve tempo che ebbi disponibile durante le missione geografico-linguistica dell’aprile-maggio 1934 constatai personalmente che a Sebha e a ez-Zighen non vi sono attualmente gruppi parlanti berbero, ma solo individui sporadici provenienti da altre località; quanto a Traghen, Tmessa e et-Tuila, le informazioni dataemi da indigeni di Sebha furono del tutto negative; mi risultò invece come berberofona el-Fogaha, che sarebbe quindi, stando a tali dati e notizie, la sola località del Fezzan orientale cha abbia conservato il berbero…trovai tuttavia, dopo molte ricerche a ez-Zighen una vecchia donna originaria di quella località, dalla qualie raccolsi un po’ di parole cha (salvo ulteriori accertamenti) mostrerebbero l’appartenenza di quel dialleto al gruppo della Zenatiya, mentre in qualche voce esso coinciderebbe in modo specifico con quello di Socna (per es. amâr uomo; miktâr asino). Regarding the woman in Zighen who Beguinot mentions, I think it would be a little much to assume an entire language on that basis—perhaps the words were Berber loans into the local Arabic dialect or perhaps the woman had learned them from visiting Berber speakers or was of Sokni descent. There are multiple possibilities. Beguinot also seems to shut down the possibility of Berber in Tmessa in the 1930s at least—nevertheless, if we don’t know anything about a language other than that it exists, how can we group it? But anyways, I don’t think that most scholars have seen this piece, buried in an obscure and hard-to-find colonial volume as it is. In his other writings, Beguinot doesn’t seem to mention anything about these essentially random places where Berber may or may not have been or was spoken—but we have no data and no firsthand reports. It doesn’t look like Beguinot is the origin of Zurg or Tmessa. The problem may originate in the classifications of Aikhenvald which precede those of Blažek and Blench, but I haven’t been able to check those works. However, if Aikhenvald had any real data, it would have appeared in other studies of Berber languages. And it hasn’t. To conclude, these handful of scholarly and internet sources seem to be the only places where the languages of Zurg and Tmessa existed. It is frustrating that some scholars simply accept them as being real without bothering to check where they have been mentioned or even if there is any data for them. So until further, firsthand, information can be found (which I think is unlikely), Zurg and Tmessa are simply ghost languages. Aikhenvald, Aleksandra. 1987. Strukturno-tipologiceskaja klassifikacija berberskix jazykov. Sintaksis. Kratkaja istorija klassifikacij berberskix jazykov. Rezul’taty strukturno­tipologičeskoj klassifikacii berberskix jazykov. Moskva: Nauka. Aikhenvald, Aleksandra & Militarev, Aleksandr. 1991. Livijsko-guančskie jazyki. In: Jazyki Azii i Afriki IV.2. Moscow, pp. 148-267. Beguinot, Francesco. 1937. “I Linguaggi” In Sahara Italiano: Fezzan e Oasi di Gat. Roma: Societa Italiana Arti Grafiche Editrice. Blažek, Václav. 1999. Numerals – Etymological Analyses of Numeral Systems and their Implications. Masarykova Univerzita v Brné. Blench, Roger. 2001. “Types of language spread and their archeological correlates: the examples of Berber.” Origini 23, pp. 169–189. Blench, Roger & Mallam Dendo. 2006. The Afro-Asiatic Languages. Unpublished Draft. Nachtigal, Gustav. Sahara and Sudan, I Fezzan and Tibesti. Translated from the original German with and Introduction and Notes, by Allan G.B. Fisher and Humphrey J. Fisher. London, C. Hurst & Company (1974), p. 178. Original title Sahara und Sudan I, Berlin: Weidmannsche Buchhandlung (1879), p. 195. في 1850 كثب علي بن الحاج عبد الطويل السوكني مخطوطة قصيرة بعنوان “كتاب المحاورة الإنسانية في اللغة العربية والسوكنية ” للرحال الإنجليزي جيمز ريتشاردسون. أرسله إلى إنجلترا ولا تزال في الإرشيف الوطني البريطاني. وها هي. There are a few works on Ghadames in Arabic, published in Libya, that might turn up interesting leads on its history and language should anyone have the time to delve into them. 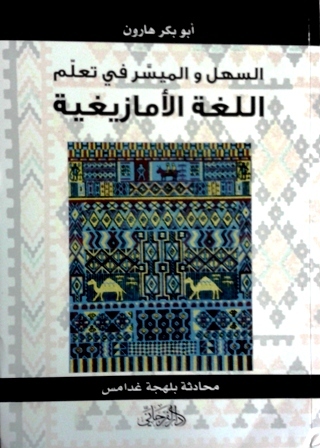 One is a grammar of the Berber language of Ghadames in Arabic titled السهل و المسير في تعلم اللغة الامازيغية بلهجة غدامس by Abu Bakr Hārūn. It’s available to order from a UK-based distributor here, though they’re currently sold out due to ‘overwhelming’ demand by Berberologists. There are 484 sayings and prayer formulas accompanying the grammatical remarks. There are also two catalogues of manuscripts and documents held in Ghadames. 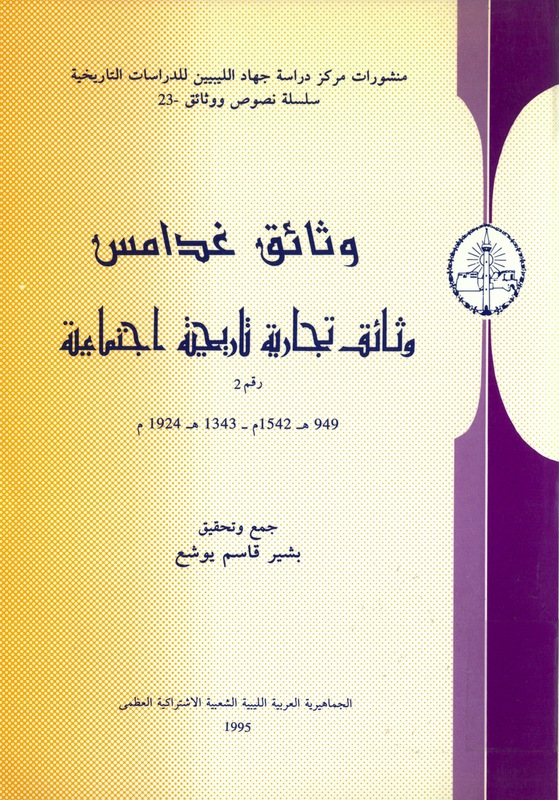 The more recent is وثائق غدامس: وثائق تجارية، تاريخية، اجتماعية, published in 1995. It may be ordered online here. 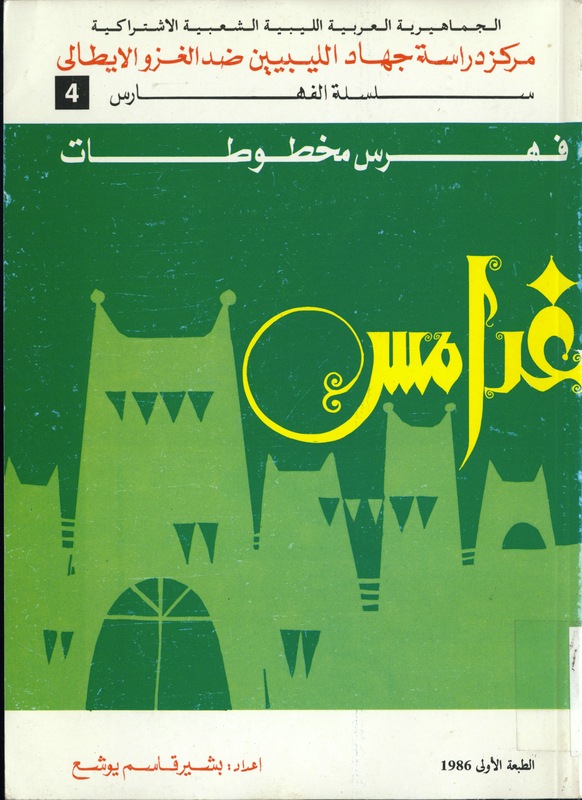 It seemingly follows on an older volume (with awesomer cover): فهرس مخطوطات غدامس, published in 1986. Both are by بشير قاسم يوشع. I had a brief flip through both volumes in the library and did not come across any mention of Berber, however, though that may be due to both having been published under the former regime. A more detailed reading might turn up clues. Here is also a plug for Maarten Kossman’s recent grammatical sketch of Ghadames Berber, the first new monograph on that language in several decades. See the table of contents here. 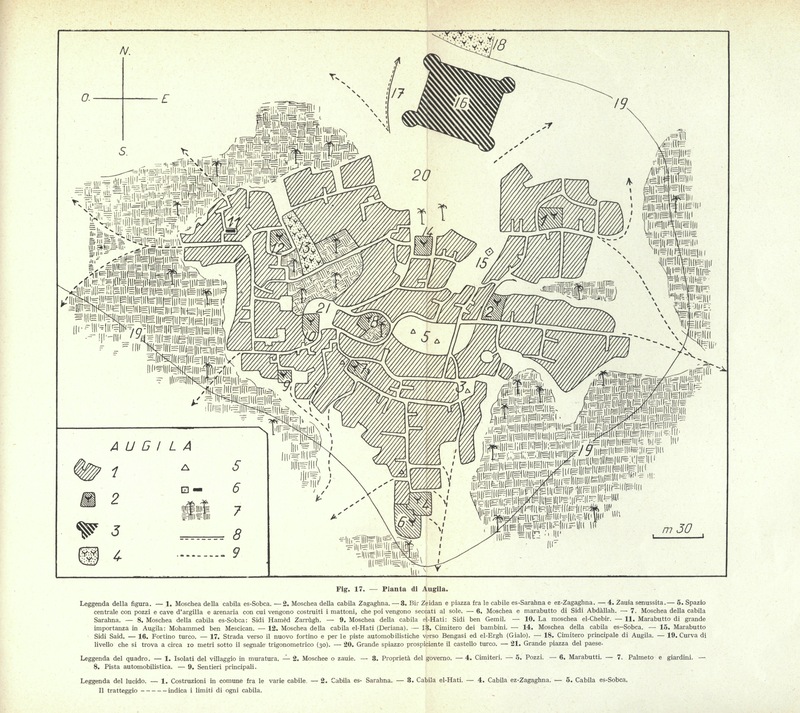 This map of Awjila comes from a work by the colonial-era Italian “human geographer” Emilio Scarin on the oases of eastern Libya, focusing on Awjila, Jalu, Jaghbub, and Marada. The high density of mosques and tombs of marabouts that Awjila is famous for can clearly be seen. The term “human geographer” is in quotes because Scarin was evidently a practitioner of the cranium– and lip-thickness–measuring type of fascist racial sciences (just check out his pamphlet “Le oasi del Fezzàn : ricerche ed osservazioni di geografia umana”). Not all of his works were of that type; thankfully the volume from which the above map is taken contains almost nothing of the sort and is full of detailed maps of the oases and plans of vernacular architecture. Scarin, Emilio. 1937. Le oasi cirenaiche del 29 parallelo. Ricerche ed osservazioni di geografia umana. Firenze. Two articles by Marijn van Putten, both historical linguistic studies of Libyan Berber varieties, are now published. “Some notes on the historical consonantism of Awjila” (Folia Orientalia 51, 2014, 257–274) can be accessed at this link. The contents of the entire issue can be viewed here. Hooray for open access! “Reflexes of the glottal stop in Nefusa and Ghadames” (Wiener Zeitschrift für die Kunde des Morgenlandes 105, 2015, 303–314), is not available online for a while but can be consulted in print format (or for an offprint contact Marijn directly or leave a comment below). At a recent conference, I met the Libyan activist Maziɣ Buzexxar, who was kind enough to answer some of my questions about Yefren Berber. As we have already seen for “hand“, words that end up as CuC monosyllables in Yefren (and elsewhere in Zenati) regularly correspond to uCeC in Nefusi (and Ghadamsi). One such word is “straw”: lum in Yefren (as in Siwa) vs. ulem in Jadu (and alim in Kabyle). Thus, in Yefren, “a pile of straw” is aguday n lum. Throughout the Middle East and North Africa, the Milky Way is referred to as “the Road of Straw” or “Road of the Straw-bearers“, with the scattered stars conceived of as straws fallen from the load being carried, rather than, as in Greek tradition, as milk. Yefren is no exception. But in Yefren, according to Maziɣ, the Milky Way is called: abrid n ulem (which he understood, with no difficulty, as meaning “road of straw”). If the facts are correct – obviously confirmation with more Yefrenis would be better – then the explanation is obvious: Yefren borrowed its term for the Milky Way as a whole from the Nefusi communities to its west, while keeping their original word for “straw”. Intra-Berber borrowing – borrowing of words from one Berber language into another – must have been an important phenomenon historically, but it is often made invisible by the sound correspondences being trivial. In this case, the Nefusi vowel shift makes it unusually conspicuous. More such cases should be sought.